As President Dmitry Medvedev sits down with his BRICS counterparts on April 14 at their third annual summit in Sanya, on China’s Hainan Island, they will include the host, China’s Hu Jintao, Brazil’s Dilma Rousseff, India’s Manmohan Singh, and — for the first time — South Africa’s Jacob Zuma. Other than adding an “S” to their BRIC logo, the question is whether there be any substance emerging from this seemingly unlikely grouping. Even joined by South Africa, it is hard to see what these five countries could have in common. Of course, they are the world’s largest economies after the Group of Seven. BRICS already account for 40 percent of global population and 20 percent of global gross domestic product, and they are expected to be a major driver of global GDP in the next decade and beyond. They will also provide positive support to their regional economies. By just demonstrating that they are not the old, tired “advanced” economies that plunged the world into a financial crisis in 2008, they can rightly contend that they represent the continuing shift in global economic power. The symbolism of their meeting may be more important than the substance. In principle, no one should expect much more than photo opportunities from the get-together. Formally the agenda for the BRICS leaders comprises some fairly anodyne issues such as foreign trade, environmental concerns and development issues. The more important questions are off the table. Behind closed doors, there is a chance for these top policymakers to exchange views on some common problems that are of more immediate concern than climate change or the plight of poor countries. More than anything, the event signals an intention to coordinate views and act in closer concert in pressing for more empowerment and perhaps even responsibility in pursuing interests that do not coincide with the “Washington consensus” of many Western leaders. Is it feasible for this diverse and somewhat artificial grouping of countries to coalesce around some priority issues? 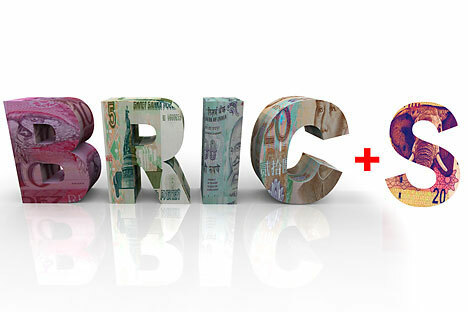 In the economic sphere, BRICS face a challenging financial conundrum. The problem manifests itself in inflationary pressures, a major domestic political issue for each of them. Since the main source of the inflation is external, there could be a basis for a common approach. The U.S. Federal Reserve, along with central banks in other advanced economies, has pursued an exceptionally loose monetary policy. The expansion of its balance sheet has created a wall of liquidity that has had to find a home. The low cost and the low returns from holding money have turned commodities figuratively into a form of quasi-money, or money substitute. Not surprisingly, the U.S. dollar has weakened as it has suddenly emerged as a funding vehicle for the global carry trade. The resulting inflation has become a common scourge among BRICS. In Russia, inflation in the first quarter increased to more than 9 percent, and in China it may have risen to a worrying 6 percent, with the other BRICS facing similar price pressures. They are fully aware of the role that high food and fuel prices play in exacerbating political strife in North Africa and the Middle East. The Federal Reserve argument is that BRICS inflation is self-imposed as a result of efforts by all of their central banks, but most notably China, to resist a sharp nominal appreciation of their exchange rates in the face of strong capital inflows, resulting in too much liquidity. While technically correct, the BRICS have a strong counter-argument: The basic source of this wall of dollars searching for higher returns is a direct consequence of the Federal Reserve’s profligacy. Usually emerging markets welcome foreign capital that can help finance much-needed investment. But the recent surge has them worried, partly because of its speed and fears of an equally rapid reversal. The International Monetary Fund recently estimated that gross inflows have risen to 6 percent of emerging world GDP in about a quarter of the time taken for a similar rise before the 2008 crisis. Policymakers also fear that this flood of capital could lead to asset-price bubbles and overvalued currencies. Many have implemented measures to stem the tide, from Brazil’s tax on portfolio inflows to Peru’s higher charge on nonresidents’ purchases of central bank paper. Even the IMF recently has suggested that exchange controls to resist speculative capital inflows may be warranted in certain circumstances. Of course, in Russia’s case the global inflationary pressures are exacerbated by policies of its own making, notably a budget that was far too expansive until recently. Even so, the ruble has appreciated by 8.7 percent since the beginning of the year, the most among the currencies of the Group of 20 countries so far in 2011. At the margin, Russia has an easier task that the other members of BRICS if only for the reason that foreign and resident investors alike remain skeptical about the country. Despite the best stock market performance among all the major economies in the first quarter of 2011, powered by a 24 percent rise in crude oil prices, the Russian balance of payments still recorded net capital outflows of $20 billion. The other BRICS have to confront the full force of inward capital flows seeking higher rates of return in seemingly the only asset markets in the world that are still attractive. All of them, except Russia, operate increasingly punitive controls to try to stem the flood of dollars. In the current lop-sided international monetary system, each of the BRICS is struggling with inflationary pressures. Out of the limelight at Sanya, what can the BRICS leaders actually do on a collective basis? Perhaps they can usefully start to sketch the outlines of a new global monetary order for the 21st century in which they, as the dominant creditors, will call the shots. After all, future global prosperity depends increasingly upon how they deploy their money. Describing the current international monetary system a few days ago in Nanjing, IMF managing director Dominique Strauss-Kahn noted that it may not be broken, but it has serious holes in it — holes that get bigger and bigger as globalization increases. Russia and its BRICS partners have weighty issues to discuss.